Are Augmented and Virtual Reality the Future of Corporate Training? More companies are deploying the technology to supplement their employee learning programs. Augmented and virtual reality are revolutionizing corporate training. In industries such as high-tech manufacturing, businesses are deploying virtual worlds that simulate the real-life settings employees will work in. “There’s a growing pool of companies that already have deployments for AR and VR enterprise training,” says Lewis Ward, IDC’s research director of gaming and AR/VR. A purely virtual setting, or one where holographic information is superimposed on a trainee’s physical environment, allows new hires to ­perform procedural steps they’ve just viewed, or can serve as a refresher course that employees can access on a job site. MORE FROM BIZTECH: Which industries are focused on building VR and AR experiences for customers and employees? That goal was one of the key drivers behind Honeywell’s Connected Plant Skills and Safety Immersive Competency offering, which was inspired by skills gap issues its customers faced due to the retirement of more experienced workers. By donning a Microsoft HoloLens and Windows Mixed Reality headsets, workers access immersive VR training to help them learn how to handle scenarios such as a plant shutdown. The technology also generates data to confirm employees are learning. Construction equipment provider United Rentals plans to begin offering new VR-based simulators this year through its United Academy division to help customers teach their employees how to operate articulated boom and scissor lift machines. The headsets trainees wear contain sensors that gauge user motion and performance, says Jim Dorris, United Rentals’ vice president for environmental health and safety. “We’re able to capture a lot of information to come up with a quantitative assessment of how capable they are operating the equipment,” Dorris explains. AR and VR technology can pose a few challenges, according to Ward. The hardware cost can be an issue, and if a company only has a certain number of available headsets, scheduling training time can also be a challenge. Still, given the comprehension and assessment capabilities the technology provides, Ward expects more employers will supplement training with AR and VR functionality in the future. Der Coworking Space Westhive in Zürich-West empfängt seine Besucher neu auch zu einem virtuellen Besuch: Basierend auf einer 3D/VR-Plattform wurde in Kooperation mit Sopact360 eine virtuelle Tour durch die Räumlichkeiten an der Hardturmstrasse 161 realisiert. Navigierbare 360-Grad-Ansichten von Innenräumen erlauben es, beliebige Locations digital zu erkunden. Die spezielle Technologie von Matterport, welche Panorama-Fotografie mit 3D-Modellen kombiniert, eröffne dabei eine ganz neue Qualität und sei eine bisher einmalige Visualisierung eines Coworking Space. Insbesondere werde die Orientierung in komplexen Gebäuden vereinfacht, indem sich der Betrachter jederzeit ein detailliertes 3D-Modell anzeigen und dann in den gewünschten Raum eintauchen könne. Sofern der Betrachter über ein Virtual Reality Device verfügt (Samsung Gear VR, Google Cardboard oder Google Daydream), kann er die gesamte Tour auch in 3D erleben. Virtual reality technology which allows social workers to experience abuse through a child’s eyes is set to be used to cut knife and gang crime following a successful pilot. The pioneering technology, which is being used by more than 30 local authorities and organisations to give social workers, teachers and district judges a better understanding of the needs of children in care, will be developed to help troubled youngsters following a spate of fatal stabbings. Cornerstone, the company which pioneers the cutting-edge technology, is in talks with London boroughs to see if it can prevent children being unwittingly exploited by gangs – and even help to de-radicalise Muslim teenagers. It comes after the programme, the first of its kind in the world which sees social workers wear headsets to experience abuse and neglect from a child’s perspective – was hailed “revolutionary” by the head of the Children and Family Court Advisory Service (CAFCASS), which represents children in care. Cornerstone’s CEO Helen Costa said: “We have been talking to those Councils most affected by violent youth crime, such as Lambeth who are willing to look outside the box to see how we can apply what we’ve achieved in children social care to the escalating issues of knife crime and youth crime and that’s our next massive challenge. 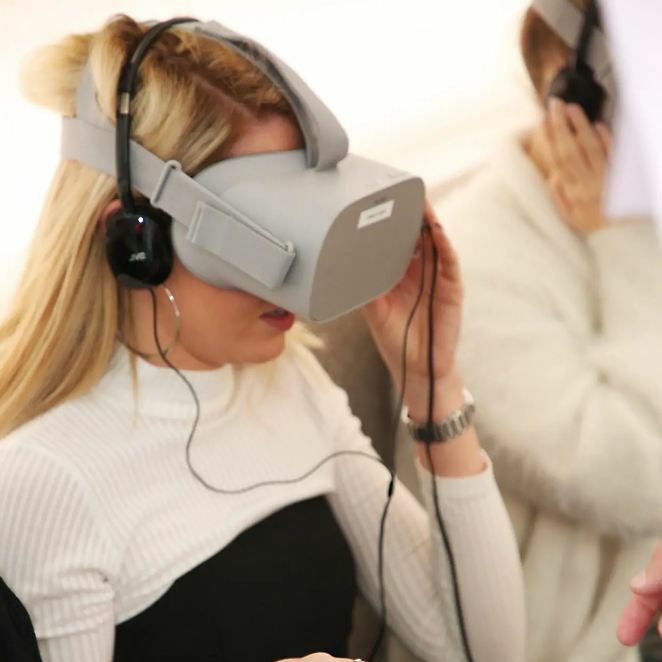 The current VR programme contains 12 episodes which give a visceral insight into the effect of abuse and neglect on children from when they are in the womb to in their late teens. The harrowing footage – see from the child’s perspective – shows a baby being shouted at in its cot, a toddler being neglected – and then explores the impact on the child’s behaviour at school. A hundred per cent of child care professionals who have used the programme since it was launched in February 2017 said they would recommend it. Mr Douglas has claimed that the day-long VR based training session can achieve as much as months of conventional intermittent training involving interviews and role playing sessions. Ms Costa, who has two adopted children, said the response from those who have used the VR technology was “overwhelmingly positive”. “Ninety per cent of social workers who used it said they would do something differently as a result, 88 per cent of district judges agreed and so did 91 per cent of teachers. The immerse VR experience has a proven track record of increasing empathy and producing better outcomes for children in care. The programme has been used with over 500 individuals including professionals, adopters, foster carers and special guardians and across all types of placements the technology has supported a change in family dynamics to enable children to stay put when the placement was likely to have broken down. “We’ve worked with many families who are still together as a result,” said Ms Costa. Time and time again, Central Michigan University School of Music faculty Mark Cox has seen students underperform at recitals, concerts and competitions simply because they were taken aback by the sound of the large space they had to play in. Students would also play too softly for the space, as they were used to practicing their pieces in small practice rooms. Cox struggled to find a solution to this problem at first – but thanks to his love of technology, he found one: Virtual reality. Cox uses his phone, equipped with AltiSpace and 360 degree photos in the Google Cardboard app, to simulate the aural and visual components of playing in a concert hall. He uses this setup to practice for his own performances, and he has begun to introduce the technology to some of his students. One of those students is Virginia senior Riley Anderson, a euphonium player under Cox. Anderson says that the system has improved Cox’s live-playing in a short amount of time. Cox himself has noticed Anderson’s improvements due to the system, and he is not the only one. Anderson participated in a concerto competition recently, in which he had to play in the Staples Family Concert Hall. He practiced with the VR system for three weeks before the competition and ended up making it into the finals. Another student of Cox’s, tuba player and Illinois junior Anthony Escalante has been involved with the system on a deeper level. Escalante teamed up with Cox to combine the functions of both AltiSpace and Google Cardboard in a single application. Escalante has high hopes for the application, and he’d like to finish it before he graduates in 2020. He said that he would like users to be able to adjust the reverberation, echo timing, echo strength and the bass, tenor, and master volume of their environment. The technology is certainly helpful to those in the music program, but Anderson thinks that it could be used by individuals in other areas. “I can see (the application) being used with private instructors or college teachers that have students that struggle with playing out,” said Anderson. “I can probably even see it being used in communication classes, because learning to speak out is also a skill, so I think using a device like that could be very helpful for students. While the full program is still a long way from completion, Cox wants to ensure that musicians and others know that his present system, being made up of two apps and a cheap VR headset, is affordable and easy to use. Due to the affordability of this combination, Cox thinks that it could be used all over to help individuals overcome anxiety when playing in spaces they aren’t used to. “Let’s say that the Youth Arts Michigan State Band Orchestra Association said, ‘Hey, you’re going to be at CMU, you’re going to be in this hall,“ he said. „Here’s a picture of it.’ You could put it in your phone and at least get used to the visual…so that when you walk out onstage you’re not awestruck. Google Earth VR is a version of Google Earth designed to work with virtual reality headsets such as the HTC Vive or Oculus Rift. Pros: Everything educators love about Google Earth is far more immersive in VR. Cons: Some may get motion sickness; alternative options for VR field trips may be more practical. Bottom Line: An amazing experience that brings the world to life, despite the heavy investment in VR required. In: Proceedings of the 2019 CHI Conference on Human Factors in Computing Systems. ACM International Conference on Human Factors in Computing Systems (CHI-2019) May 4-9 Glasgow United Kingdom CHI ’19 ISBN 978-1-4503-5970-2/19/05 ACM 2019. Experiencing materials in virtual reality (VR) is enhanced by combining visual and haptic feedback. While VR easily allows changes to visual appearances, modifying haptic impressions remains challenging. Existing passive haptic techniques require access to a large set of tangible proxies. To reduce the number of physical representations, we look towards fabrication to create more versatile counterparts. In a user study, 3D-printed hairs with length varying in steps of 2.5 mm were used to influence the feeling of roughness and hardness. By overlaying fabricated hair with visual textures, the resolution of the user’s haptic perception increased. As changing haptic sensations are able to elicit perceptual switches, our approach can extend a limited set of textures to a much broader set of material impressions. Our results give insights into the effectiveness of 3D-printed hair for enhancing texture perception in VR. Immersive technology is blowing up everywhere, and that includes higher education. As Augmented Reality (AR) and Virtual Technology (VR) transform the way we shop, play games and even construct military strategies, universities are fielding increased demand from employers and aspiring students to produce graduates with the skillsets to work in this field. In the UK, the result of this is a growing number of AR/VR courses being offered at the pre-university, undergraduate- and postgraduate-level. From software development to digital art to imaging in engineering, this emerging technology is popping up in a wide range of disciplines. We're here at the Skills Show again today showcasing our Virtual Reality equipment! Come & see us on our open day on Saturday 26th November, 10am-2pm and you can have a go too! This two-year course aims to prepare students for higher education, a degree apprenticeship, a level 4 apprenticeship or employment in this field. Year one is focused on the learning of the fundamentals of IT, AR/VR, the Internet of Everything, project management, product development, mobile technology and computer systems. Year two follows with classes on topics such as cybersecurity, cognitive computing, cloud technology, application design, games design and prototyping, etc. If you have plans to become a designer in the AR/VR industries, this could be the perfect bachelor’s degree for you. Students will learn the “skills required to create VR/AR simulations, games, visualisations and apps”, according to the university’s website. This includes creating 2D and 3D digital artwork, as well as computer animation and sound for VR/AR. There will be collaboration with the school’s BSc Virtual and Augmented Reality (Software Development) programme as it is fundamental for students to see the production ‘pipeline’ in VR/AR development. Gregorio from Milan Bicocca meets Lemptegy Volcano in virtual reality. 3DTeLC in University of Portsmouth. For UoL’s new Master’s programme, the focus is on sensory presentation engineering, as well as the hardware and software needs of immersive technology. Students will learn about “human perception and its practical delivery via virtual reality”, according to UoL’s website. It’s a postgraduate qualification catered to those seeking a career in digital engineering, research or a PhD within the discipline. With Royal Holloway’s close proximity to the South East regional hub of electronics businesses, students can also benefit from links to some of the top UK-based electronics companies. This is the Master’s course for those seeking to “explore and develop the application of VR technologies across filmmaking, visual effects (VFX), animation, games and immersive augmented reality (AR) experiences”. During the one year and three-month long course, students will receive technical resources and specialist guidance needed to test and develop virtual experiences across a range of media platforms, including 3D computer animation, 360-degree filmmaking, games and interactive AR applications. This engineering doctorate is run by the UCL Centre in Virtual Environments, Interaction and Visualisation (VEIV). VEIV is a world leader in the science and engineering of computational capture, rendering and simulation in a diverse range of applications. This DEng serves as an alternative to the traditional PhD for students who want a career in industry. For this three-year programme, candidates will undertake a PhD-level research project under the supervision of two academics and complete five Milestones. Im Cybergym in Unterentfelden AG gibt’s nur schweisstreibende VR Anwendungen. Zur Auswahl stehen: der Turm, eine VR Fitness Tour und GoalieVR. Der Service von Sromline verspricht jede Menge Fun und Action. Wer sich eher zu den Anfängern zählt, kann sich mit der VR Fitness oder Goalie VR einen ersten Eindruck erhalten. Die Spieler bekommen einen Einblick in verschiedene Virtual Reality Aktivitäten, so dass sie die körperliche Anstrengung spüren können. Für Fortgeschrittene bzw. erfahrene Kampfpsportler gibt es Towermax Fitness, ein intensives soundbasiertes Virtual Reality Fitness Training. Spieler trainieren auf einem Turm, der mit deiner guten Leistung höher wird. Es gibt Ziele zu treffen und Objekte zum Ausweichen .Es ist ein effizientes Ganzkörper-Training, durchschnittlich werden 1000 Kalorien pro Stunde verbrannt. Durch persönliche Einstellungsmöglichkeiten kann das eigene Training zusammen gestellt werden. Es gibt verschiedene Arten wie man auf dem Turm trainieren kann, hart, intensive, locker, mixt, die Ausdauer, die Beweglichkeit, die Koordination, die Kraft, die Schnelligkeit, die Technik. Man kann mit Intervall-Timer trainieren und einen Herzfrequenz-Sensor verbinden. Das Training wird aufgezeichnet, so kann man die Statistik anschauen. Die Grundelemente sind Geraden-, Haken- und Kinnhaken-Schläge, Kicks, Kniebeugen, Steps, Laufen, Ausweichen und andere Bewegungen. Alle Sequenzen sind zufallsgeneriert. Das gibt den Spielern immer ein anderes Training. Im Cybergym ist man privat mit einem Instruktoren und man kann mit allen Funktionen trainieren. Die Ausrüstung wird dir zur Verfügung gestellt. Besucher bekommen eine Einweisung mit der Bedienung, solltest man Virtual Reality nicht kennen. Danach verbringt man die restliche Zeit Aktiv in Virtual Reality. Es braucht 2-3 Trainings-Einheiten, bis man sich in das Training mit dem Turm eingefühlt hat. Aber auch schon einmal reicht aus, um ins VR Fitness rein zu schnuppern, laut den Betreibern. Trainings kann man für CHF 35 buchen. Wer Kampfsportler ist und Kick-Erfahrung mitbringen, kann jetzt eine gratis Towermax Fitness Session testen. Sromline sucht Tester, die für sie den neuen Kick-Mode ausprobieren möchten. Mehr Informationen dazu findet ihr wie alles andere auf der Webseite. Virtual Reality in digital learning is trendy. However, not every use case seems to be really useful for the learner. How can Virtual Reality be used efficiently in the onboarding processes? The use of Virtual Reality in digital learning is becoming increasingly important. This trend was also reflected in LearnTec’s own VR/AR area. As a visitor, one could look at different companies and technologies as well as practical examples. The enthusiasm is great and the possible applications seem limitless. However, one should critically question the use case, not only in terms of cost and time. Because as always, the best technology without the right concept brings no real added value. Technological progress has already cut costs considerably. Meanwhile, the cost of VR glasses with a built-in display is a few hundred euros. As a result, their use can also be implemented efficiently and effectively in the learning area. The didactic background is much more complex: What should be conveyed, what is the advantage of VR, which elements should be used? It is not unusual to see practical examples which at first glance seem innovative and impressive, but at second glance the actual meaning can be doubted. Why is a 360° space created in the virtual world, in which something only happens within 45°? Why is a quiz placed in the virtual space, in which the learner has to cumbersomely choose the correct answer with the help of his head movement? Rather, the focus should be on the benefits of Virtual Reality and be cleverly linked with learning elements. Virtual Reality has to be intuitive, interesting and uncomplicated for the user. This rule generally applies to all digital learning products. Virtual spaces should be used where space actually plays a role. In this way, the industry can also find significantly more suitable use cases than in the classic office environment. For instructions of a machine, more than just the control panel is important. The safety regulations of production/warehouses also cover the entire environment in which the employee can move. It is more difficult to work out meaningful application scenarios in the office area. Onboarding is a good example when it comes to making it easier for new employees to get started in the new company. What does the future workplace look like? Which colleagues are sitting next to me? In which direction is the HR office and where is IT? Which requirements regarding data protection in the workplace do I have to consider? All of these can be suggested to the new employee as part of the onboarding process as part of a virtual space. In this case, the advantage of the 360° view can be fully exploited. Learning elements, such as infoboxes, point out important aspects in a room. Is the screen locked when leaving the workstation? Are confidential customer documents open on the office table? What is this paper in the bin? What special features should be considered in a large office? Answers to these questions can be found in virtual space and experienced directly. An excerpt of it can be used in addition to onboarding in recruiting. In general, it makes sense to reuse parts of the virtual space to save resources and, at the same time, create a recognition value for the learner. As an expansion stage, a multi-level virtual journey in the form of an expedition can be designed. In addition, more virtual rooms such as the reception, the canteen, the meeting room with Kanban board or the outdoor area including parking lot are added. Here important hints or peculiarities can be incorporated as learning elements, too. The goal is to create an overall picture for the learning and develop a topic such as onboarding extensively. This not only creates a virtual space but a small virtual world and uses the added value VR has. Successful digital learning is based on a balanced triad of technique, content, and concept. In particular, when using innovative technology such as Virtual Reality, the conceptual work is all the more relevant to the success of the project.